French bulldogs are one of the most popular breeds chosen by potential pet owners nowadays. These dogs with their big expressive eyes, flat nose and bat ears could easily have been the idea creators’ inspiration for the 80’s Hollywood movie ‘Gremlins’ except that they are the cute and cuddly ones rather than scary and aggressive. Frenchies, as they are often called, come in a big variety of colors. Breeders and pet owners alike struggle to pin down any perfect type or color of a Frenchie. And French bulldogs do come in a large variety of colors, with or without patches and with a price tag ranging from a few thousand to many thousands. Sounds like a brand of clothing sold in a store ? Well not exactly. Even though there is a certain amount of unethical commercialization and trading, as is the case, for all pedigreed dog breeds since this breed of dogs are in high demand. In reality I do believe french bulldogs are also loved as companions for their loyal, loving and intelligent disposition. In the case of French bull dogs, the demand is always for the rarer colors such as the blue french bulldog or the chocolate colored french bulldog. Those colors are not acceptable by AKC. They can be registered, but can not be shown in AKC. It is fad colors. In fact there is also oftentimes a connection made between the health of a pup and its coat color which I decided to call the ‘color health‘ of the french bull dog pup. This is so in particular in the case of health problems and health complications even in some cases sicknesses that a french bull dog may be prone to because of its genetics as it grows into maturity. For french bulldogs, brindle as a color is dominant over fawn and a uniform color is dominant over the pied color. Hmmm what color could that be I thought when I heard brindle or pied. For those of you who are first time readers and may be confused with the words like brindle or pied, ‘Brindle’ means a solid coat color frequently interspersed with lighter colored hairs and ‘Pied’ or piebald means a light coat with patches of a darker color. When I first heard the word brindle even the word pied I was surprised to associate them with the color or pattern of cute cuddly squashed nose french bull dogs. Thanks to many enterprising scientists and doctors there is now also extensive research on this subject of color genetics among dogs specially pedigreed dog, as gradually all the genes that affect color of skin, eyes, hair and masks/noses are being located and mapped on the chromosomes. Also available are some DNA specific tests that can be carried out for the presence of color alleles. While it is complicated information even basic knowledge of the color genetics of a breeding pair can greatly help to produce healthy litters of french bull dog pups. When this information is recorded with documents at registration with the AKC time this can also help pet owners be better informed and to get a slightly clear picture of what they are getting into. Less or restricted MSH produces reddish brown or yellowish tan. There are many loci of different color genes and which have even more alleles that vary in them. All dogs carry these color genes irrespective of the breed of dogs, but no one breed or dog carry all of them. French bull dogs have their own set of alleles and loci for color on their genes. Surprising isn’t it ? Some have rose ears ( soft floppy cuddly ones) others have bat ears ( straight pointy ears), some have dark masks or noses or light masks or noses. In short all this factors brought together manifest into the cutest, cuddliest most adorable and also intelligent loyal companions and pets. Fawn is among one of the acceptable colors listed in most kennel club’s breeding standards and includes fawn and fawn pied. It is a color of a frenchie, recognized by the American Kennel Club or AKC ( as it is also known as) as also by most other kennel clubs across the globe. Adding to the many shades of fawn, however, there are two colors of blue fawn and chocolate fawn. The last two colors are rare, much in demand and fall into the category of non acceptable colors as per most breeding standards. Those colors can be registered by AKC. However, those colors are not acceptable by the AKC standards, they are listed as faulty in the standard description. The A series (agouti) pattern locus is usually associated with fawns, including sable effects and patterns in some fawn frenchies. Fawn pied french bulldogs may range from being a light color with one or more patches of a darker color, like for instance, fawn on white, black on fawn and so on. Amongst fawn french bulldogs the blue fawn french bulldog is a rarity, although the presence of the recessive black dilution gene in a fawn frenchie manifests in a grayish fawn color specially around the mask. Blue fawn, as I mentioned, also is not acceptable color. The dogs of that color can be registered in AKC as grey and white. This color is also listed as a faulty color by the AKC standards. Some Frenchies have the mask which is black. It is an acceptable color for the American Kennel Club standards. Also, a lighter colored nose and lighter colored eyes are acceptable in light colored fawn frenchies. Some fawn frenchies are without a dark mask. The word brindle itself refers to a coat color and pattern in animals especially dogs. As per the Merriam Webster dictionary the word brindle was first used for an animal color in 1696. Brindle when referring to an animal’s coat in particular a dog’s means a brownish or tawny color of fur with streaks of another color in it. It is, however, one of the most common color of Frenchies that is acceptable to the AKC for French bulldogs. When used to describe french bull dogs in particular the color brindle usually means a darker coat with lighter colors hairs interspersed in between. It could also mean the reverse, a lighter colored coat with darker hairs mixed in between. In a brindle French bulldog the lighter or darker interspersed hairs could range from a few (known as lightly brindled) to medium brindled to heavily brindled. In a lightly brindled black french bull dog, the brindling is hardly visible and this type of french bull dog appears to be almost pure black. Pure black is a color not accepted by the AKC breeding standards. Brindled black however is a color acceptable to the AKC standards. In fact, like I said before a black brindled coat coloring is very common among French bull dogs. It is also a very handsome color. In come cases, heavily brindled french bull dogs have a coat coloring which is known as tiger brindled. These Frenchies have a predominantly dark coat with reddish fawn hairs mixed in between visibly looking almost like very lightly colored tiger stripes. Very unusual. The color Brindle with White usually refers to a black brindle coat color in a French bull dog with white, red or fawn hairs patterns on the dog’s coat. In Brindled Pied Frenchies the main color is white with various colored patches of black or a darker color throughout. 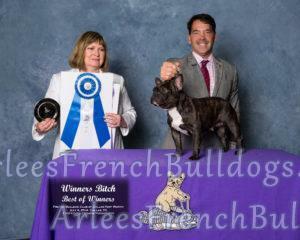 These patches must have a brindle otherwise such a French bull dog color would become disqualified as white with black which is not acceptable to the AKC. All of these three types of coat colors – brindled black, brindled with white and brindle pied are also colors that are acceptable to the AKC. 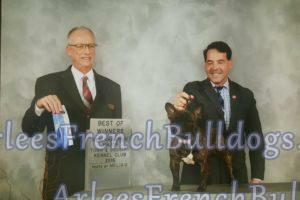 Among the brindle colored french bull dogs there are also two rare colors. These are blue brindle and chocolate brindle coat colors. The french bull dogs which have these two rare coat colors often have yellow golden eyes which are also rare. Although frenchies with these two unusual colors are beautiful and in demand, there are some groups that state that their eye color and coat color may indicate health problems. A blue brindle french bull dog will have slightly bluish greyish overtones in their otherwise black coat color. Much like a blue french bull dogs this is because of the recessive dilution gene that this type of French bull dog carries. Blue brindle Frenchie’s coat color can range from lightly brindled with or without patches or heavily brindled with or without patches. The masks/noses of such French bull dogs could have the same bluish greyish pigmentation and also the same on their face. The chocolate brindle french bull dog has a coat color that can range from a light milky chocolate color to a dark chocolate color and this type of Frenchie could also be lightly brindled or heavily brindled or pied. When the chocolate colored french bull dog carries the recessive blue dilution gene its coat color can carry bluish tinges making it visible as lilac in color. are not acceptable AKC colors. Black brindles, reversed brindles can be shown and usually do very well in a show ring. Almost always the masks of brindled french bull dogs are dark colored but once in a while their mask may be a light color with black patches as in cases of pied frenchies or brindle pied frenchies, as they are also called or they may be without mask, as it is called. Cream French bull dogs have an eggshell like coloring. Usually cream French bulldogs are thought to be fawn or diluted fawn even so cream is a separate color and pattern from fawn. Cream is lighter than fawn. Fawn looks like a tan color. Often times, people call fawn frenchies tan. Fine example of a cream french bulldog is Sid. His picture is on my web site on “My dogs” page. Both: cream and fawn are AKC acceptable colors. They can be shown and do well in a show ring. The E or C or Albino series pigment locus is responsible for the diluted fawn or cream color in French bull dogs and also sometimes white. 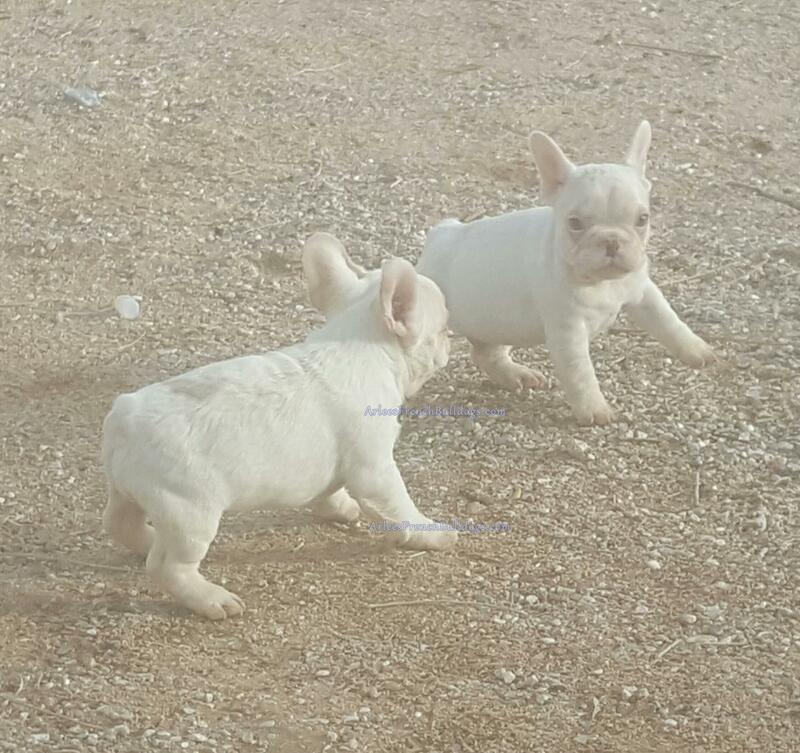 Cream colored Frenchies are different from white coat coloured Frenchies. This color is acceptable to the AKC. If french bull dogs are cream pied their color is usually cream with fawn patches which may or may not have an orangish overtone. Cream french bull dogs can have a dark mask or may be without mask. It is a popular color, not easy to breed. It is acceptable by AKC. I personally had very few puppies of that color. These colors do well in a show ring, but usually it is more challenging to show them versus fawn or cream. Judges usually give preferences to a solid color dog. But there are plenty of exceptions. Some judges love the pied patterns. A white french bull dog has a coat color that ranges from all white to partially white dogs. These Frenchies are usually white with a black mask and can also include pied white French bull dogs. 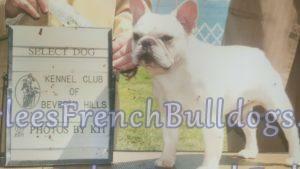 White color french bull dogs are acceptable to the AKC. There are two different genes that give the white coat coloring in the french bull dog’s coat. One is the Merle gene on the M locus which when present in double gives an all white dog and the other genes are the alleles on the S locus. According to research both these genes may carry deafness or ear impairment defects in white colored french bull dogs. There is a Behr test which can be done, which will assure that the dog is not deaf. I, personally had a few snow white puppies. None of them were deaf. Deafness can occur in any color really. I have seen a white and fawn deaf frenchie, I have seen white and brindle. I have never came across a deaf brindle dog. So far. But brindle is really considered the basic color, the rest of the colors are variations from brindle, which were developed by the breeders thru the selection process. Although sometimes some Frenchies, since they are pied and depending on their coloring may actually fall into another color category other than white. However even in such cases sometimes white frenchie with color patterns also called tickled pied although considered acceptable, are already penalized at many dog shows. Excessive ticking is not desirable in the show ring. White and brindle French bulldogs usually have a black mask. Sometimes they may also have an all white mask with a little bit of black. There are many other colors and patterns among French bull dogs which are disqualified by the American Kennel Club or the AKC as it is also known as. These colors are also not acceptable to the breeding standards of many other Kennels Clubs across the globe. Many of the Frenchies having these colors are rare and beautiful breeds like the blue French bulldog or the all pure black french bulldog without any brindle. Also included in not acceptable colors for the AKC standards are.. Pure black french bull dogs have a solid all black coat color. They have no brindle hairs in their coat. Pure black french bull dogs without any brindle have this pure black coat color due to a recessive black gene they carry. The D dilution series pigment locus or the new K black series affects their skin/coat, eyes, nose and hair color. This recessive gene is on their A locus. The pure black french bull dogs often have dark eye color and sometimes beautiful sapphire colored dark blue eyes. This is a rare color which is very handsome and much in demand. 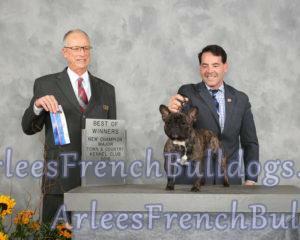 This color without brindling is not acceptable to the AKC. The masks of pure black french bull dogs are also usually dark. The beautiful and also much in demand type of french bull dog has a beautiful black or dark grey overtones to their coat coloring which make them look very handsome. Over the years and even in present day, blue french bull dogs are much adored pets and companions to many celebrities including famous Hollywood celebs. Their who’s who owners list is very long, and that’s easy to understand ! Why ? With their soft cuddly rose ears or pointy perky bat ears, soulful big warm brown eyes and handsome greyish black or fawn grey coat color this frenchie pup is hard to resist. However, this color though rare and beautiful is not acceptable to the AKC. So why are they rare ? The answer once again can be found in color genetics. Blue French Bull dogs carry a double recessive black gene along with a double recessive dilution gene. This is responsible for the beautiful navy bluish or dark greyish overtones in their coat color and beautiful big soulful brown or dark sapphire blue eyes. 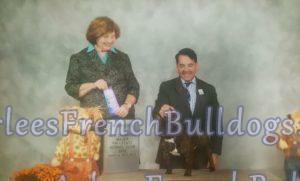 There are also Blue Pied French bull dogs and Blue Brindled French bull dogs. Blue French bull dogs may or may not have a black or greyish masks. Tan is a color shade between cream, fawn and brown, sometimes even brownish red. Remember the term “tawny like a lion”. Well that’s pretty much the color. My tans usually turn into reds when they get older. Any shade of tan is a very attractive color. Those dogs look very different from their dark members of the breed. While this color is acceptable to the AKC, tan points or feet are often not acceptable. Some tawny French bull dogs which have some tan color patterns on their coat with the color tan and black or blue and tan which include markings for which usually dobermans or rottweilers are better known, such as black and tan feet or blue and tan are also not acceptable to the AKC. In addition French bull dogs have many more colors like lilac, chocolate and sable and even more color patterns like chocolate and tan, white and red, snow white and so on which I have not mentioned here. Like I said, their variety of colors is truly astounding. However, as a breeder, I breed according to AKC standards, meaning AKC acceptable colors. 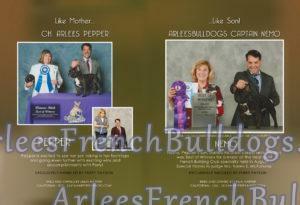 My very own bred-bys are very much brindles, who won a lot of shows, and became champions.